Many people fear traveling, and let that keep them from exploring the world. It’s much safer to stay at home, right? What if something really bad happens? Like a terrorist attack or someone unhinged taking innocent people hostage? This actually happened while I was in Sydney recently. 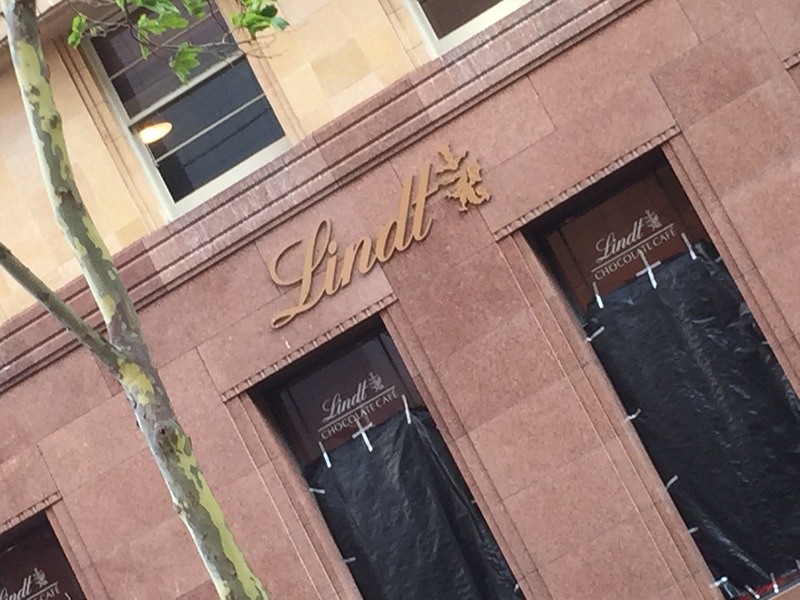 I was, in fact, less than 3 blocks away from the Lindt Cafe where a lone man took 17 people hostage and held them at gunpoint for 17 hours. I had no idea when I passed through town between train and ferry on my way to Manly Beach that anything was amiss. 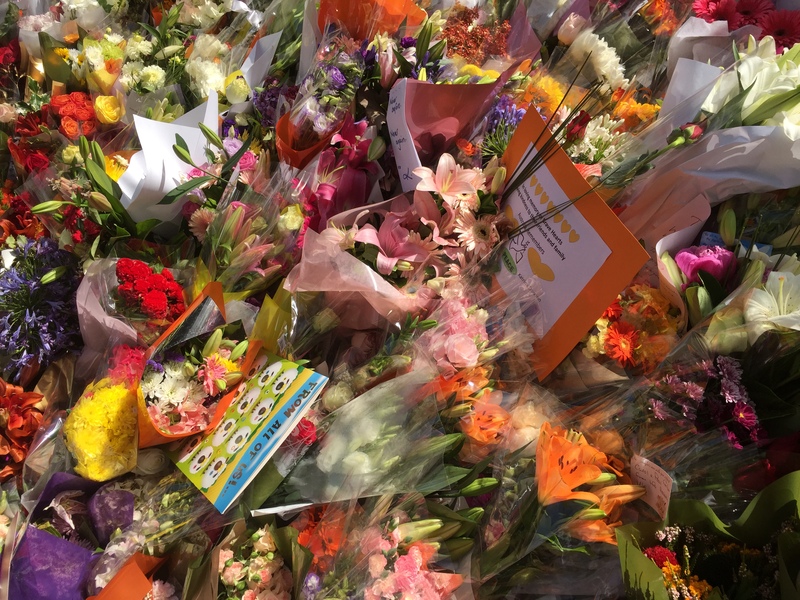 I wondered briefly why the 2 police officers at the station entrance I asked directions of had what looked like bullet proof vests on – they looked a bit overdressed – but I went on my way and spent a lovely day walking along the shore. A couple at the beach mentioned there was something going on in the city, some kind of situation, but they had no details and were pretty sure it would all be cleared up by the time I returned. When I passed back through downtown around 7pm, the city seemed rather deserted compared to when I’d been there over the weekend, but I figured it was Monday, the business people had probably gone home & maybe it was a slow tourist day. I had no idea that 2 1/2 blocks away a situation was taking place that would end in tragedy. 15 eventually escaped, 3 lost their lives, including the gunman. Would I let this keep me from my travels, make me run back to the States in fear? Not a chance. The police handled things beautifully, kept things under control. I witnessed no panic on the streets, and the authorities did everything they could to facilitate as positive an outcome as possible. Things can happen anywhere, and statistics would say you are much more likely to get harmed within 10 miles of your home than on a trip. 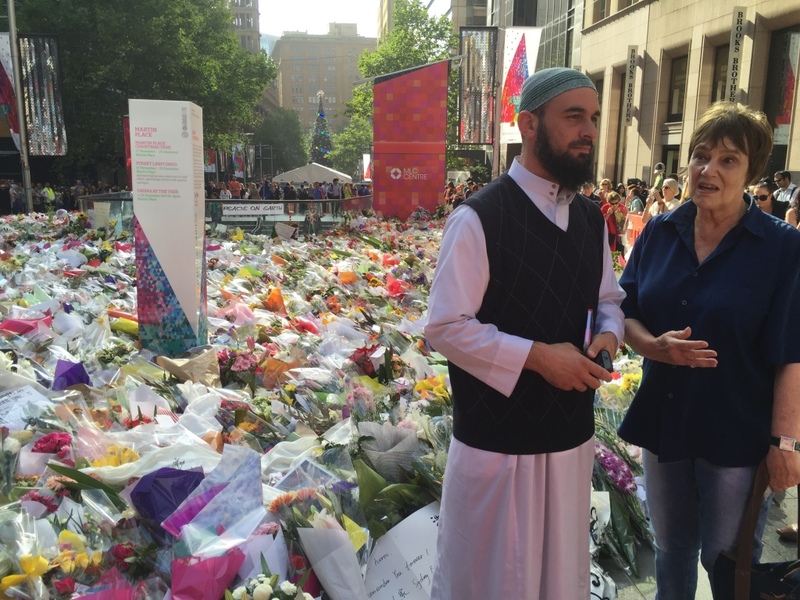 The after effects of the Sydney siege amazed me and warmed my heart. 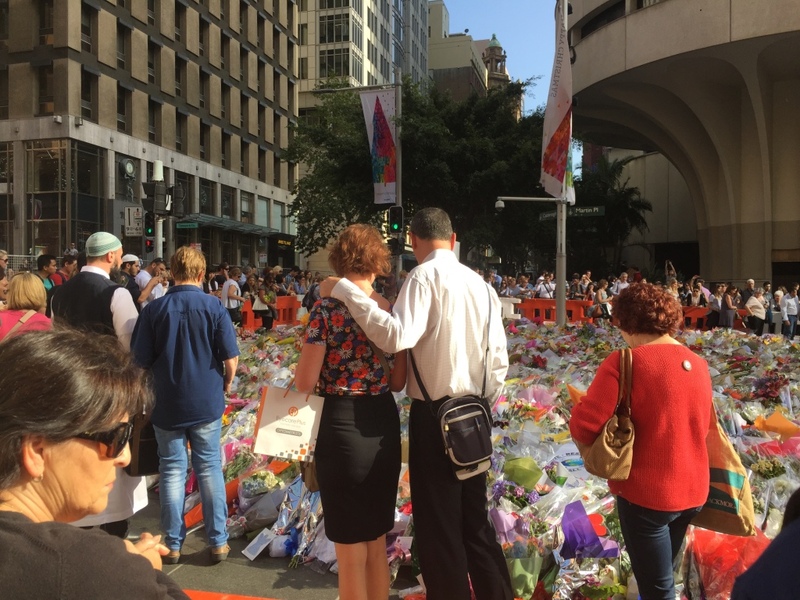 Instead of hiding in their houses, thousands of people flooded Martin Place with a sea of flowers and cards of condolence, and some stood with signs offering hugs. 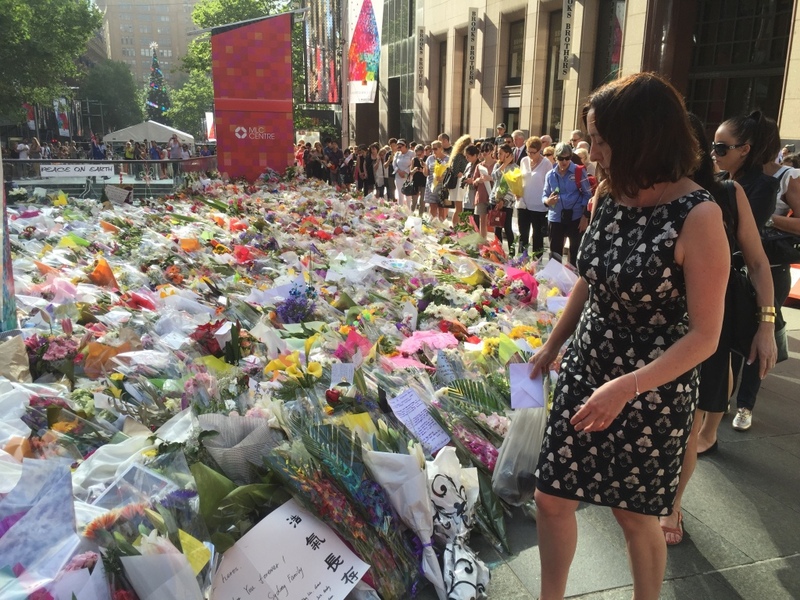 People of all ages & races & religions stood patiently in line to pay their respects and leave their floral tributes. 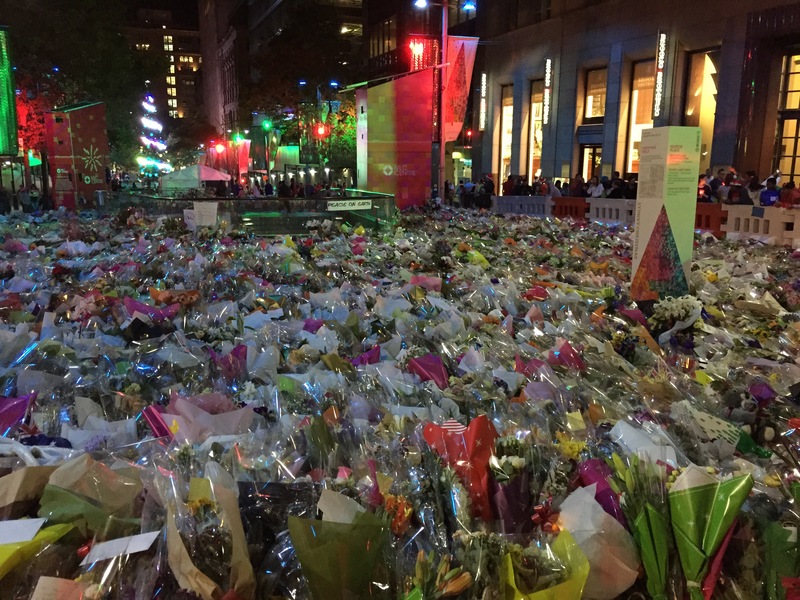 It happened, it was horrible, and then people got on with their lives, not because they were callous, or forgot easily, but to show that they won’t let the actions of one deluded man succeed in stopping them from living their own authentic and full lives. 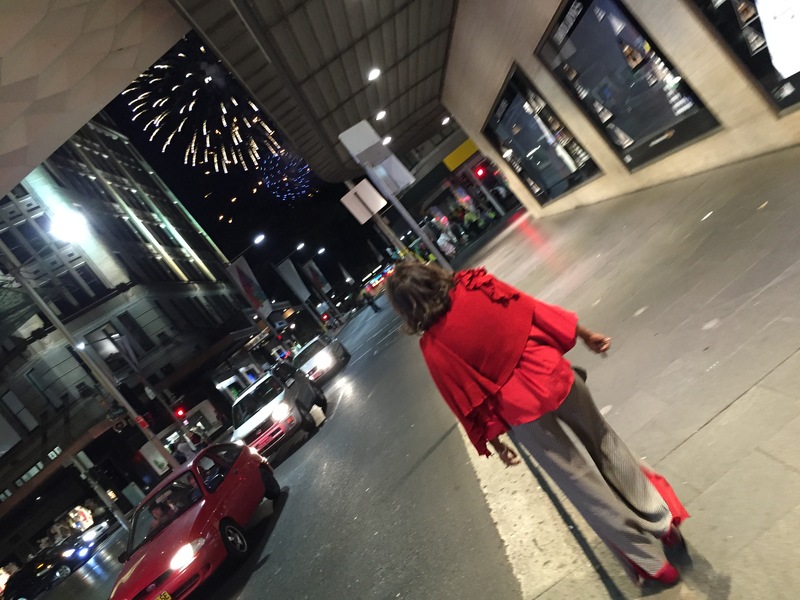 Later in the week, my last night in Sydney, Soraya & I took a train downtown, and while walking up George Street we heard a pop, pop, pop, of what sounded like a gun. We were a bit startled, until we looked up and saw the bright sparkly blossoms of fireworks bleeding light across the sky between the skyscrapers ahead. We stood with others on the sidewalk, oohing & aaaahing, finding out later that they’d decided to let the Carols in the Park celebration go on, showing affirmation and solidarity in adversity instead of fear and defeat. You’re very welcome, Amanda. Thank you for sharing your lovely country!